Five years ago, I decided to purchase the domain radiodiffusion.net after my old site got mentioned on Boing Boing and crashed from the traffic. I had no idea what I was getting myself into. A good friend of mine even tried to talk me out of it. But here we are, and I still am pretty clueless as to what I am doing or where I am going with this unruly beast of a site. What started out as a little web page for a handful of friends, now gets about 400 to 500 hits a day. The original intent, or should I say the inspiration, was just that there were practically no web sites out there where you could hear this stuff. And it seemed like the few that did exist, only used RealPlayer – and who wants that headache? I started this because there were, and still are, hundreds of records that I just wanted to hear. I didn’t need to hear the whole thing – just enough to get an idea of whether or not it was worth tracking down. At the time, there were only a handful of compilations and reissues available. There was nothing from Iran. Since then, there’s a whole label dedicated to music from that time period as well as a few other great compilations. Angola, Burma, Iraq, Pakistan and Vietnam were all completely off the radar. Now those countries’ – as well as many others’ – musical histories have been unearthed and are now readily available to be heard. This – plus the many other amazing music sites that have sprouted up since – has turned many fellow music fiends into collectors, seeking out these records. But what else is there to say that has not already been written about Ethiopian Jazz or Khmer Pop? And more eloquently than my own ramblings, I might add. Both of those countries have compilation series whose volumes number up into the twenty some odds now. Or how about Thailand? How may compilations have been issued? I can name at least fourteen just off the top of my head. Add in the mind boggling Monrakplengthai, and you pretty much have what seems like the entire recorded history of that country. And Turkey? Nigeria? Indonesia? Benin? It goes on and on. Unfortunately, one thing has become clear – Radiodiffusion Internasionaal can not continue on as it has. I’ve painted myself into a corner, metaphorically. I mean, there are plenty of records – and cassettes – that are left to post. But the ones that I really want to write about, I have not been able to get my hands on. So, I have been tying to figure out how to take this site in a slightly different direction. I just have not figured out what that direction is… Yet. In the meantime, got any suggestions? For information on Menelik Wossenachew, please see the previous posting HERE. 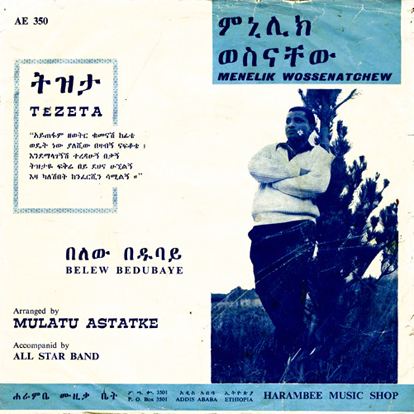 Catalog Number AE 350 on Amha Records of Addis Ababa, Ethiopia. Released 1972. 2nd, from a regular reader’s stand point, your site is a perfect little gem…would hate to see it change too radically. I post a good deal less than I used to, and I stopped making my own comments in the tracks several years ago. I really didn’t have much to say – just want people to listen and to find more work by the artists and buy it. i doubt you are as “painted into a corner” as you might think… just give it all some time. I don’t know. You could maybe work with co-contributors. Maybe branch out into slightly different genres, such as experimental and avant garde music from other countries. such a beautiful recording! thank you for sharing it. Your site is, of course, amazing, and I personally would want it to continue. Yet, I can totally, completely relate. This has to remain interesting to you. And while they are often exactly what keeps one going, no amount of positive comments, virtual high-fives and other niceties can really cut it in the end – it has to be something you look forward to doing. If it’s not, well…why not change it up? Why not dramatically change it? Replace every mp3 with Side 1 of ELP’s “Love Beach”! Do we even deserve all the work you’ve done for us? (Can you tell I sometimes suffer from my own brand of blog rage?) Regardless, chances are we’ll continue to benefit from your hard work, no matter what happens. I really love your blog as it is, but I guess it’s always a good idea to change things around a bit, especially if you’re growing tired of the format. I guess one area that new cd reissues aren’t covering all that well is the re-release of full LPs, so maybe that ould be one possible direction. In any case I hope that, whether in this format or a different one, you will find the energy to keep up the unearthing of wonderful musical gems. As I’ve told you many times, your blog is an amazing archive of some of the best music ever made. And the music here has had a profound influence on my life. For that sir, I thank you. Maybe some other people with great record collections, cough, ahem, XXXXXX [Redacted – ed. ], would be kind enough to do a guest spot or two. Whatever happens, the work you have done already stands on its own as mind blowing and fantastic. Be sure and let us all know when you DJ next. Peace. As you and I have discussed in the past, almost all of the people I have approached to do guest posts have their own blogs / compilations to feed with material, on top of a hectic schedule of traveling / touring and what not. So getting those folks to cough up something has been… Well, I’ll just say fruitless – with a few notable exceptions. Honestly, I’m not sure what is next. i have rally no idea on what you can do in the future (you will find the answer), but I just want to thank you for the massive work you’ve done. Frequently i have discovered really interesting and obscure music on your web, and sometimes we play it in our radioshow (underlying that the source was this wonderful page). Personally, I think that your page is still necessary, even if a lot of obscure material had been reissued. The way you orgnaise the material and the information that you collect represents a very usefull tool for music courious peoples. Knowledge is fundamental to understanding the world, and your contribution to music history is going in this direction. Anyway,thank you very much. Sincerly. I appreciate what you have done with the website so far. Thanks for broadening our horizons with these rare music tracks. The funny thing about activism is how it aims toward its own obsolescence. The hole you sought to fill is now a mountain. Okay. So forget the mission. What sounds like fun? You own the domain name not the other way around. I’m a bit sad to see that the blog is “dead’ and I have no suggestions at all but I wanted to thank you for all the work you put in it and the wonderful songs I have veen able to discover thanks to you. Did anybody here ever come across 78 rpm records from Ethiopia ?